you are here: Home » News » THE PLAYBOOK – SUIT UP. SCORE CHICKS. BE AWESOME. THE PLAYBOOK – SUIT UP. SCORE CHICKS. BE AWESOME. Are you a fan of the CBS series How I Met Your Mother? Or perhaps you are a fan of scoring chicks? If you thought ‘yes i am’ to either of these questions you might be interested in a new book by Barey Stinson with Matt Kuhn called THE PLAYBOOK: SUIT UP. SCORE CHICKS. BE AWESOME that hits stores on October 5th. For those of you familiar with How I Met Your Mother, you’ll know that Barney Stinson (played by Neil Patrick Harris) is a suit wearing, womanizing, powerhouse that women can just not say no to. 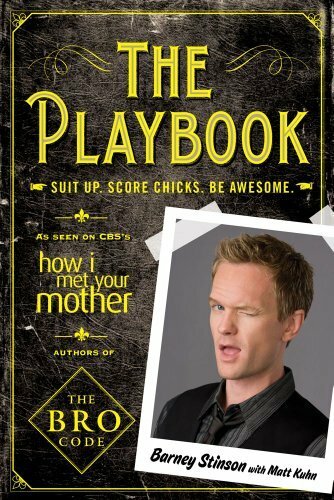 In one memorable episode called “The Playbook” Barney demonstrates all the different way he’s able to score chicks using scenarios in a playbook that he compiled. Now, you can get your own copy of The Playbook as featured on the show. Check out this video to see an exerpt of The Playbook as featured on How I Met Your Mother. Included are more than 75 schemes that are guaranteed to attract all kinds of women, from art chicks to groupies to biological tickers. • The “He’s Not Coming” – Go up to every single woman you see on the Empire State Building observation deck and tell her, sadly, “He’s not coming.” Sooner or later, you’ll strike gold. • The Mrs. Stinsfire – Think Mrs. Doubtfire in a sorority house. BARNEY STINSON has slept with countless women yet has never had a pregnancy scare he’s legally aware of. When not explaining how to be awesome on his popular website www.barneysblog.com. Barney enjoys modeling underwear, bottling one of his 83 wine labels, and being photographed with orphans, abandoned puppies or anything that really sells “vulnerable” when accompanied by a Sarah McLachlan song. MATT KUHN is a writer for the TV show How I Met Your Mother. In addition to producing “Barney’s Blog” he has written five episodes for the show including SLAPSGIVING, THREE DAYS OF SNOW, and DOUBLE DATE. He has also written two other books in collaboration with Barney Stinson – The Bro Code and Bro on the Go. Matt lives in Los Angeles with his wife Alecia and their dog Maggie who, despite being full-grown, is not taller than his knee – a clear violation of The Bro Code. Oops.